Qansuh al-Ghuri was the next to last Mamluk sultan, and the last to enjoy a reign of any duration between 1500 and 1516 AD. Al-Ghuri (Ghuriya, Ghouri) seems to have been an energetic fellow who was still playing polo in his 70s. He was also a somewhat arbitrary depot who could be cruel and superstitious. Time and again we here of someone who was savagely tortured in order to extract money, or of someone else who was hanged or cut in half for some offense, real or imagined. On the other hand, al-Ghuri appears to have taken his responsibilities seriously, and was a great builder. He also loved flowers and music, wrote poetry, and was attracted to Sufis and other pious men. Had he not further ruined an already weak economy by his avarice, he would have probably gone down in history as one of the better sultans. He died (some say of a heart attack) fighting the Ottoman Turks outside Aleppo, following the defection of Amir Khayrbak in the midst of the battle. His body was never found and his tomb was thus occupied by his successor, the unfortunate Tumanbay, who was originally buried in the courtyard behind the mausoleum. 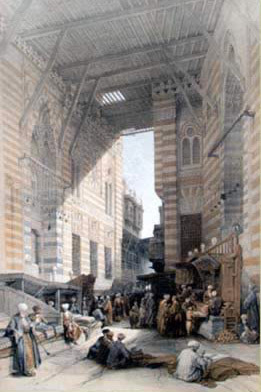 Sultan Qansuh al-Ghuri built his funerary complex between 1503 and 1504 in the Fahhamin quarter (charcoal market ) on al-Mu'izz street in Islamic Cairo. Though there was a clear decline in the quality of craftsmanship, particularly in stone carving and marble inlay during his reign, this is an interesting architectural composition built on both sides of a street. In this regard, they form one of the most impressive hyphen, or double ensembles in Cairo. 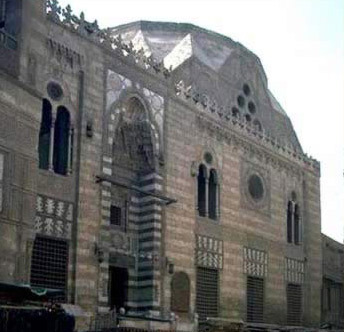 The western side includes a Friday (congregational) madrasa-mosque built on the qa'a plan, while the eastern side includes a khanqah and mausoleum as well as a sabil-kuttab. "the new building was richly decorated and garnished with profusion of marble. It was a splendid construction of sumptuous elegance, to which one could compare no contemporary monument. 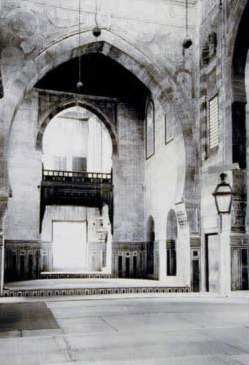 Nevertheless, the Sultan was generally reproached for having built with the aid of illicit confiscations, not to mention the fact that most of the marble had been taken from other buildings and bought at ridiculous (forced) prices..."
The madrasa and mosque was built in the late mamluk cruciform style and was certainly inspired by Qaytbay's Mausoleum and Madrasa, but it is larger in scale and its details are less elegant. The effect is of a pleasant, masculine building with strong features and a functional design. The western facade of this complex has a trilobed stalactite portal, a tiraz band and a minaret projecting at its south edge. The minaret is atypical of this period. 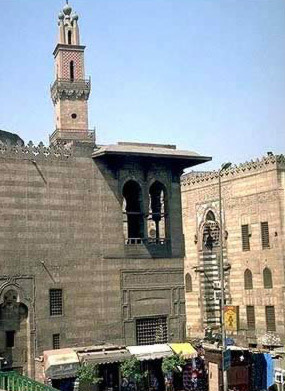 Normally, Mamluk minarets consist of square, octagonal and round layers, but this four story minaret is rectangular from top to bottom, with arched panels on each side. The top originally had four bulbs instead of just one, and they were made of brick covered with green tiles. However, in 1505 after it was noticed that the minaret was leaning, it was reconstructed and the upper part was made with bricks covered with blue faience tiles. The present top with five bulbs is a modern addition, and a misrepresentation of the original one. There were already minarets with double bulbs, such as those at the mosques of Qanibay al-Rammah and that of al-Ghuri at al-Azhar. When Muhammad Bey Abu'l-Dhahab built his mosque he crowned its minaret with five bulbs. Also, the red and white checkerboard squares that adorn the minaret are actually painted on, and very crudely at that. Within, there is distinctive polychrome marble dados, flagging laid in geometric patterns and gilt and painted wood paneling. There is a central sunken and open courtyard surrounded by four iwans. The two largest of the iwans have Moorish arches, while the smaller two have raised arches. The interior is richly paved and paneled with black and white marble. Stone carving covers the walls but it is of poor quality, shallow and repetitive. 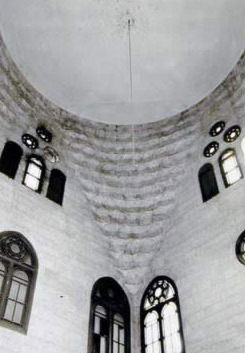 Of interest are the stalactites that frame the upper walls of the covered courtyard, underneath the skylight. This part of the complex today functions as a cultural center. 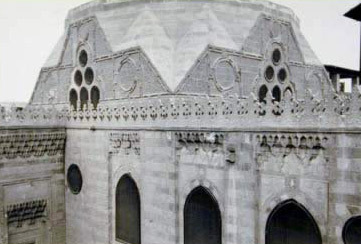 The facade of the khanqah and mausoleum also has a trilobed stalactite portal and a tiraz band. On its northern edge a sabil-kuttab projects into the street with three facades. The interior of the sabil-kuttab is highly decorative, with marble floors and ceiling supported by rounded, painted and gilt beams. Within, from the vestibule, the funeral chamber is on the right, and to the left is a prayer hall with three liwans evenly distributed around the raised and covered part of a lantern. got it right. We know that the mausoleum dome of Imam Shafi'i was also covered at one time with green tiles, perhaps after al-Ghuri's restoration. The transition zone is made of stone pendentives. Perhaps the most interesting feature here is the carved surface of the wall. From just above the marble wainscoting to just below the springing of the missing dome, the whole wall is carved in an arabesque pattern which gives it a curious look of stone brocade. 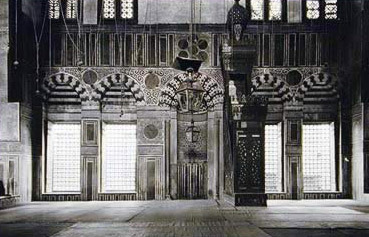 However, the beautiful marble slabs that once decorated the madrasa, having been confiscated by al-Ghuri from someone else in the first place, were in turn confiscated and taken to Istanbul by Selim I in 1517. On the left or north side of the entrance vestibule is a qa'a, here called a khanqah, even though no living units were attached to it. Earlier khanqahs did provide housing for Sufis, but this was increasing rare during the late Mamluk period. The waqf deed states that Sufis should have their meetings there, but does not refer to any living accommodations provided for them. However, there are a few living units attached to the madrasa across the street, which was probably student housing those the foundation deed does not mention teaching activities. of the minaret of the madrasa. The square was rented for market stalls, the income from which contributing to Sultan al-Ghuri's endowment of the foundation. At one time the square was roofed over, and when David Roberts drew the square in 1839, it was a silk market. This support continues even today. There are still shops here on both sides of the street, and the rend is now collected by the Ministry of Waqfs and used in maintaining the religious buildings and their personnel. While Al-Ghuri himself was never buried in his mausoleum, several others were prior to the sultan's death. The first was a daughter of his in 1505, followed by his son, Nasir al-Din Muhammad, age thirteen, and by one of his concubines. The latter two were victims of the plague. In 1510, al-Ghuri also had the three year old daughter of his secretary of State, Tumanbay, buried here.